Day Nine of my trip gave me the opportunity to attend for different meetings of Grace Gathering. 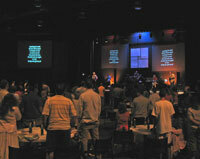 Corporate worship at Grace Gathering (GG) happens on Sunday morning in a multi-purpose gym/meeting hall with concert-style lighting, commercial grade carpet, and tons of round tables for gathering around during the service. And while the praise band led worship from the stage, the pastor spoke from the middle of the floor, which I thought was great. There’s an unspoken message communicated in the arrangement of a room, and having the preacher address the congregation like this really says something. Chris’s message was about using a variety of forms of expression for worship. It was interactive. It began with a call for people to share personalized Psalms they had written the week before, and three people took advantage of the open mic to read theirs to the whole congregation. I loved that. My only disappointment was that he cut it off after only three. I wanted to hear many more. But I guess he had a lot more to say, and only so much time to say it. After he spoke about raising hands or clapping during worship, we sang a song and did what he suggested. After he spoke about laying prostrate before God in worship, we spread out and did just that. I thought that was pretty well done. He encouraged all who were in attendance to go home to their home churches and try putting these forms into practice. Clearly there was fundamental integration between the equipping ministry of the teaching pastor and the work-it-out-in-real-life function of the house church here at GG. As my hosts, the Heckleys, told me, the HC setting “gets trumpeted” from the pulpit (or gym floor) every week. And that’s what it takes. The guy up front’s gotta believe in it, or it just won’t fly. After “big church” (as we called it growing up) I had the pleasure of joining one of the small groups for their meeting in one of the rooms at the church building. Because this group specializes in ministering to people with special needs, they use the church’s handicap-accessible facilities for their meetings. Today they were having a party, and I had a good time. One new friend wandered in looking for some company and found a room full of accepting folks. Since he had lost his wife several months ago, he was clearly still hurting and looking for some fellowship and encouragement. He seemed to have found it the moment he walked in. I was touched by that. 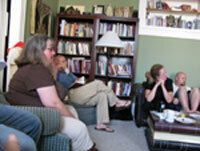 I was also touched by the warmth and encouragement of the group as prayer concerns and updates were offered. 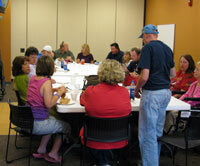 The fellowship and community-knitting was evident to me, an it was like water for my soul. We prayed for one another, ate some pizza, and played Mad Gabs and laughed a lot. It was a good party, with some very sweet people. I’m glad Scott recommended visiting them. Immediately after that the leaders of all the HC’s at GG got together to talk about their progress in the transition from “attractional” to “incarnational” (those aren’t their words, I borrowed them from somewhere else). I was glad to sit in on this meeting as well, because I got to see some of the downside to this task. There was some notable discouragement apparent in the group, as many of them were struggling to transfer ownership of the small group from the leaders to the rest of the Body. This is where the rubber meets the road, and it takes some outstanding ministry to change folks from passive spectators to active participants in the work of the church. The way I see it, the gospel is not just a short story, with four or five bullet points telling you how to “get saved” and go to heaven. The gospel, as I understand it, is a much larger story that begins with God seeking to establish a family on Earth whom He will inhabit, and through whom He express Himself in visible, tangible ways. This is what Christ came to accomplish, and it doesn’t stop when you get saved–it’s only just begun. I think that larger story, when grasped and communicated in all its vast richness, FUELS the mission of the church in such a way that your methodology becomes so much less important then what drives the activity of the church. More to the point, I think a church can major on pragmatic goals, structures, methods, and measurements, and never really hit that “sweet spot” that I’m talking about. When you hit a golf ball right, it makes this beautiful “click” noise, and you have to feel it to know exactly what I’m talking about. That’s what happens when the ball and the club come together the right way. All the golf lessons in the world won’t fix your game until you discover what hitting on that “sweet spot” feels like. It’s kind of like that. When a group of people really SEE what it means to be in Christ and for Him to be in them, as a them, it changes everything. It opens up a world of ministry that wouldn’t make sense in any other context. Folks have to see what it means to be the Body of Christ. It’s like an epiphany. 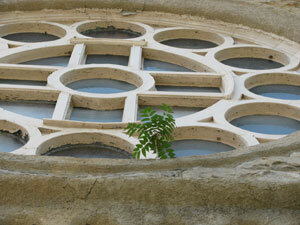 You mind shifts and suddenly you look at the church in a totally new way. Folks at GG (and Apex and anywhere else) will have to be struck by this realization. Something has to click in place in their minds before the church really “gets it” and becomes what she was meant to be. I’ve known this for a long time. But what’s new to me at the moment is the possibility that our actions may sometimes precede our thinking just as readily as the other way around. I was taught that belief always precedes action, and that you have to change how people think before you can change how they behave. Nowadays I’m not so dogmatic about this. I’m beginning to wonder if it’s just as likely that you can initiate new behavior and watch it gradually lead to a changed way of thinking. In other words, belief and behavior are symbiotic, just like the different corners of the triangle from the last post. Sometimes one precedes the other, but sometimes it’s the other way around. I dunno. Just something I’m processing these days. The upshot of all this is that I still think churches need a significant amount of ministry from its leaders in order to equip them to do the work of the church (see Ephesians 4:11-16). I still think that ministry needs to be heavily soaked in the “bigger Christ” and the “bigger cross” that I wrote about in Christ In Y’all. But then, that’s why you write a book, isn’t it? Because you believe in something? My visit with GG ended with a visit to one last HC, this time at the home of Brad and Heather Thomas. This group felt more familiar to me than so many previous ones this week because these were all young families with small kids. Their logistical struggles were similar to ours (what do you do with/for all these kids?!). But this group felt like they are still figuring out what they’re about, in a way. The leaders of this group still hold the reins, and they’ve got a long way to go for that to no longer be the case. What encouraged me most about this is that they know this is their objective. 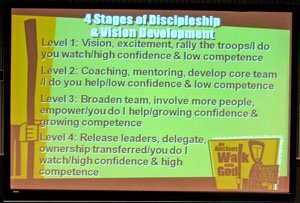 They discussed that shift in functioning from the leadership to the rest of the Body, and that means they’re light years ahead of so many other churches who don’t even know that’s their goal. There’s a significant hurdle to jump when it comes to this transfer of leadership and it remains to be seen whether it can be done on this scale all at once. Which is easier: Starting small, with a single small group, building in the distributed leadership from the beginning and building outward from the first group, or taking a medium-sized church (with several hundred people) and rolling out a transition plan for all of them en masse? The latter would take some serious patience, humility, and a very slow pace in order to be done well. And the former? Well not everybody has the luxury of starting from scratch, or the gifting for it. I sure see some benefit to being a part of a larger support network from the beginning. Starting small from scratch means starting with precious few resources. Maybe it’s a different story in the midst of a nation-wide revival (e.g. Xenos in the Jesus Movement), but what about right now? What about in the South, where more people trust the validity of an established church than some fly-by-night rogue folks starting their own thing? On a personal note, I enjoyed hanging out some with Brad Thomas, who reminds me of me in a lot of ways. Only he’s got real design skills, and designs logos for a living. So I asked him to come up with a new cover design for my book (and this blog). I’ve wanted that since the very beginning, and now it looks like the Lord provided somebody to fill that need. Woohoo! You should see a way cooler book redesign soon, so stay tuned. I’ll also be revising the book in order to account for some of the shift in my thinking over the last year or two. I hope to have it ready in time to send to the next House Church conference in Dallas. There’s so much more that can be said upon reflection about this trip. It’ll take me a while to unpack and digest all that I saw and heard along the way. But I’ll try to tie it all together a little in the final post in this series. 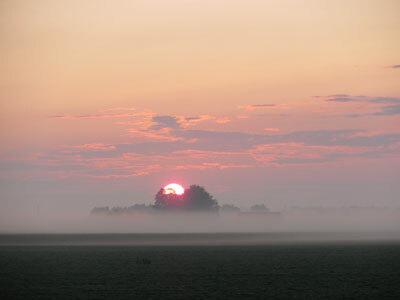 In the meantime, I leave you with a couple of photos I snapped on my way out of Indiana early Monday morning. While Grace Gathering (GG) has long been into tweaking their organizational structure (previously they divided up into several mini-congregations), their foray into the house church model followed on the heels of a visit to England in order to learn from St. Thom’s. Both Scott and Chris Norman, GG’s teaching pastor, spent a good bit of time researching models and ideologies in order to find the right fit for their church. Once again, I am reminded that this kind of transition requires that the “up front” people buy into this vision or else it won’t fly at all. And like Apex in Dayton, these folks found that the transitional period unavoidably leads to a thinning out of the congregation. Some folks like just sitting in a pew, thank you, very much! They don’t want to be thrown into a living room where they’re suddenly expected to function in some way other than taking up space. Perhaps the stories of Apex and GG warn us that churches need lots of “transitional ministry,” where the newer, decentralized model gets an extensive introduction, and where fundamental mindsets about church get challenged “from the pulpit” as it were. But again, that throws a good bit of responsibility back on the leaders, who will likely be improvising so much that they wish they had a script or an outline to follow once in a while. I think both churches (Apex and Grace Gathering) illustrate the importance of getting help from other people (or groups) who have already implemented some of this decentralization themselves. Apex has gleaned some from Xenos and from the previous HC experience of a couple of their elders. Grace Gathering very studiously sought out examples, models, and even consultants who specialize in helping churches do this kind of thing. This transition is NOT EASY. It’s messy, and you’ll quite certainly lose folks in the process. But counting nickels and noses can’t be too important to you if you’re going this route, so maybe folks know to expect that already. 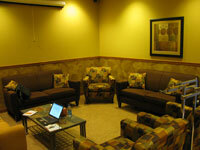 When numerical growth necessitated that GG build a new meeting facility, they kept it minimalistic. Their building consists primarily of a single meeting hall (which is actually a gym with indoor/outdoor carpet and a stage) attached to an inviting coffee house-style foyer, plus a few smaller meeting rooms for smaller groups and kids programs. One medium-sized room houses the kids worship meeting, and there’s a cool little den with some video games hooked up to an LCD projector. 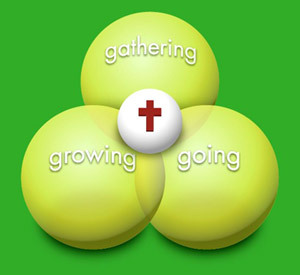 Grace Gathering borrows heavily form St. Thom’s conceptual world, tossing around phrases like “low control, high accountability,” plotting their course according to four stages of growth (which I found pretty instructive as well), and perhaps most helpful of all, borrowing Mike Breen’s triangular UP, IN, and OUT visual in order to balance out the priorities of the church. As long as nobody sues me for it, I’ll be stealing these things myself, thank you! 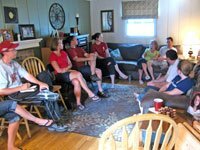 Each home church that forms within their network is expected to develop a “missional focus”–a ministry to a specific target like troubled teens, or low-income immigrants, or a food bank. And in time most of them do. Following the advice of Kent Hunter (aka The Church Doctor) a while back they decided to group their HC’s together according to missional focus. So now there is a cluster of churches ministering to the needs of a sizable local Burmese population, another cluster serving with Angel Food ministry, and another working with a local youth center, etc. This way, the separate groups don’t feel quite so isolated in their ministries and they can draw strength from each other’s numbers. Pretty cool idea, I think. As fabulous as all this looks on paper, I still have some reservations about how they’re going about it all. I’ll need to save that for another post. But for now, I have to compliment my hosts, Todd and Sue Heckley, for their entertaining conversation and their warm hospitality. And for letting me come stay a couple of nights in their home, which was just a few hundred yards from the church campus (very convenient!). One of the things I look for when I visit a group is the effect it has on a person after a decade or more. I’m not particularly interested in how great things look after a year or two. 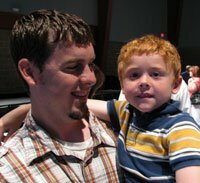 How does a person fare after 10-12 years in a church? That’s something worth noting. That’s also why my ears perked up when a member of Xenos asked Ajith Fernando about how to maintain lifelong relationships when your home groups reconstruct and reproduce every three to four years (as they do with Xenos). This commitment to duplication/multiplication is largely responsible for Xenos’ enormous size and successfulness (they’ve got over 4000 members, most of whom are regularly plugged into 270 house churches!). But something is lost when you keep multiplying so many times over again. As this sister admitted to me later, you can only connect at such a deep level so many times before you can’t really do it so well anymore. 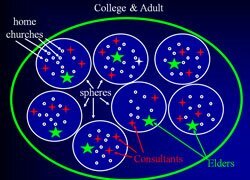 You become close to people over a period of years only to have them redistributed in order to start a new group with a new set of people. And with schedules as busy as they have, there’s not really any space left for maintaining relationships outside of your most immediate relational commitments. Consider, for example, a sample Xenos member’s weekly commitments: You and your spouse meet with a house church one night a week, but you also lead a group of college students in their house meeting another night. 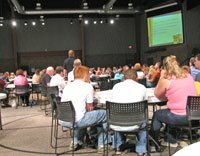 You attend a “central teaching” once a week at the main campus along with the rest of the house churches in your “sphere” (cluster). Your children attend different central teachings and home groups, though, and since one is a high school student and the other is an elementary student, they keep two different gathering schedules, too. But that’s not all. 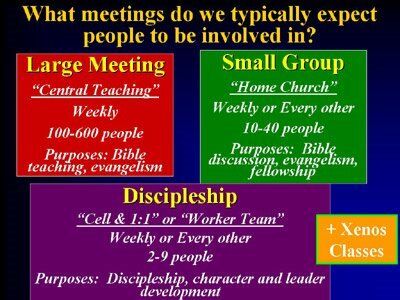 Since a good “xenoid” also disciples people, you’ve also got a weekly meeting with at least one younger believer for prayer, counsel, and teaching. You will likely also meet occasionally with others who are discipling folks in what are known as “workers’ meetings.” Add to that one purely social outreach event a month and a prayer meeting or two and BAM! You’re burnt out in a few years. It just seems a bit over the top to me. And since those groups regularly subdivide as a matter of principal, I can see how lifelong relationships would be really hard to maintain. And one of Ajith’s main points was that the church should be providing a witness that’s counter-cultural, resisting the fragmented, frenzied style of life to which we’ve all become so accustomed. Needless to say, that sister’s question caught my attention and confirmed a lurking suspicion. To be fair, I should admit that some seem to be managing this kind of busy-ness with grace and competence. My young hosts, Jim and Lisa, seemed quite contented with their commitments and spoke highly of the lifestyle in which they have lived for several years. When I asked them about burn out, they countered that a life of giving yourself over for others tends to be replenished by the Lord so that there’s always enough of you to go around. Once again, I found that both encouraging and challenging. I only want to see how families with several kids balance this kind of schedule without losing something in the process. I believe it was Mike Breen (more on him in a later post) who developed the triangular conceptual framework for church life. You see an adapted version in the image below. We have three dimensions in which we travel, or three directions: UP, IN, and OUT. UP refers to our worship, IN refers to our fellowship within the Body of Christ, and OUT refers to our outreach and our interaction with the world around us. Apex calls these Gathering (IN), Growing (UP), and Going (OUT). They’re both useful frameworks, so I’ll be adopting the basic idea for a while. 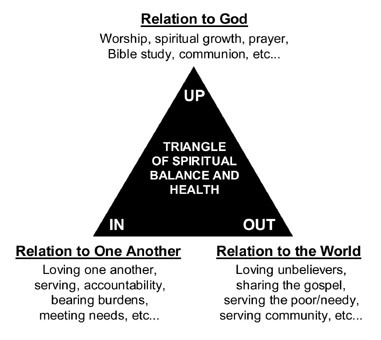 My contention is that every church seems to choose one of these three dimensions to emphasize. The other two merely serve the third and at least one is bound to suffer as a result. My group has always stressed the UP direction at the expense of the other two, especially the OUT dimension. I believe Xenos stresses the OUT at the expense of the IN. I see the potential for alot of burn-out among members of a church which neglects deep and lasting peer relationships in the interest of always growing, duplicating, expanding the kingdom. Maybe I’m way off here. I’m significantly open to that possibility at this juncture of my life. But I might as well admit my bias. I suppose time will tell if I’m off or not. The way I’m thinking about it, those three aspects of the life of the church are symbiotic, and need to be in balance with one another. Without the UP, you lose the motivation for both the IN and the OUT. Without the IN, you burn out chasing the OUT and the UP. And without the OUT, the IN becomes stagnant and the UP weakens, too. They feed one another. Well, anyway, the conference ended on a good note, with an encouraging message from Gary DeLashmutt, one of the lead pastors of Xenos. He spoke about keeping Joy in your life, which felt like a perfect message for the moment somehow. Maybe I’ll write more about that another time. It tracked for me personally because I’m in a place of needing to rediscover the joy of knowing God, perhaps as it so naturally comes in introducing people to Him for the first time (or maybe even re-introducing people who forgot that there’s more of Him to know). And it tracks for Xenos because, as I’ve supposed already, the emotional side of life may be missing from their experience these days. 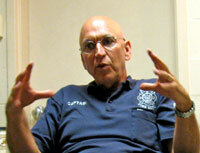 Either way, Gary is highly spoken of among those I spoke with, and he didn’t disappoint. 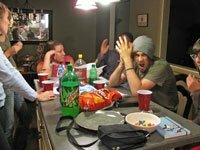 I had a good time hanging out with them that evening, especially since we spent way too much time engaging in one of my favorite pastimes: quoting movie lines from every conceivable genre until your eyelids get too heavy to keep it up. If I ever get to come back to Xenos again, I’ll be sure to visit at a time when I can sit in on more home church meetings, since that’s what I came for. But the conference was challenging, and thought-provoking. Well worth my time. The second day of the Xenos conference began with a talk from a former teacher of the church, Lee Campbell, on suffering in the book of Job. He did a great job of pointing out how Job’s friends didn’t have a bad encouragement plan to begin with–they just flubbed it up after they got very far into it, and they had some bad theology in there, too. What struck me most was that they invested a good bit of their time and resources to spend time with Job in his loss, even to the point of sitting with him a whole week without saying a word. Lee explained that rabbinic tradition calls this “sitting shiva” (sitting a week). It’s significant because it simply involves moving with the sufferer, being with them and feeling what he/she feels, because that’s what is needed more than advice or platitudes (which Job’s friends couldn’t resist offering later). When C.S. Lewis lost his wife, he said he wanted most to be around lots of people who would just “leave him alone”. I think I get that. Anyway, it was a great talk, and you can download it for free here. The rest of the day took a decidedly urban-missional direction for me. 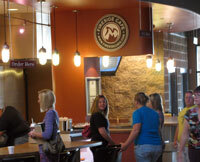 I had signed up to tour Xenos’ urban mission over lunch, and it was an encouraging tour to take. Nearly 20 years ago some folks from Xenos took an interest in ministering to a poor urban neighborhood close to the Ohio State University campus. 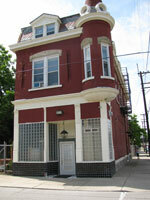 Today there are house churches, after-school programs, and an easily affordable Christian school in that neighborhood. The Harambee School, financed jointly by Xenos and by government grants, serves to educate about 100 kids from K-5th grade. 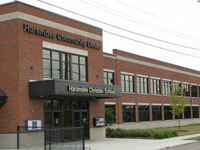 And while other schools in the area can only get about 20% of their kids to pass the state tests, Harambee’s kids are passing at a rate of 67%. That’s pretty fantastic! They must be doing really good work. On the tour we heard from James Brown, the director of the larger urban mission, and Alex Steinman, the principal of the school. They explained how the church engages the neighborhood holistically, not merely babysitting kids for a few hours each day, but ministering to entire families, entering into their lives where they live. 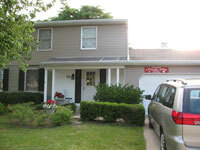 Families invest huge chunks of time, many of them permanently moving into the neighborhood. Over time they’ve built lasting relationships with area residents, including the crack dealers on whose turf they’re treading. Ironically, they seem to get a warmer reception from the thugs than they do from the local churches, who hardly give them any help in their work (most of those churches are comprised of members who commute from far away). Somehow that’s funny and disgusting at the same time. Back at the conference, I attended a workshop entitled “Untying the Urban Knot.” Lisa Gintz told us of her own relocation to a poor urban segment of town, and of the subsequent validation of her ministry that produced in the eyes of the residents. She, too, found that the local criminals warmed to her presence so that now her house is the safest place on the block. The drug lords warn their underlings not to touch her place because they like her, and they trust her. When asked by conference-goers if she felt safe there, she replied, “The safest place in the world to be is in the middle of God’s will.” Well put. And she’s definitely earned the right to speak about urban ministry. The gist of her presentation was that building incarnational relationships is the only way to truly impact a community. It takes years to earn the trust of people who have learned so much distrust. And it takes years to learn how to relate to people from a culture so different from your own. One helpful bit of advice she gave was to start by reaching out to people within your own culture before you make the leap to people in a significantly different one. We tend to romanticize “ministry to the needy,” so there’s quite a revolving door in urban ministry. People come dreamy-eyed and last for a year or two then give up. They too often come solo, too, and that’s a recipe for burnout as well. In the end I was encouraged and challenged to see and hear from those who have built their lives around giving to others. None of them struck me as highly religious or legalistic about it, but seemed genuinely and organically compelled to be doing what they’re doing. There were other workshops that day, but I’ve written enough for now. Next, I’ll briefly tell about the conclusion to the summer institute and the home group that gathered afterwards, then I’ll move on to the last church I visited: Grace Gathering. 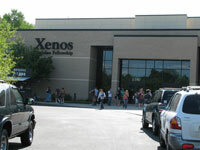 I attended two afternoon breakout sessions on the first full day of the Xenos Summer Institute. The talk which one of the session leaders gave confirmed a suspicion of mine: Xenos heavily emphasizes doctrinal education (which is intellectual), personal discipleship, evangelism, and service (those are volitional), but appears to offer little which engages the affective side of the human self. Internally speaking, they resist the more subjective, mystical expressions of devotion which so characterize the fellowship to which I belong. And externally speaking, they don’t make much place for emotional expressions of praise or worship, either in big gatherings or in most small group settings. I suspect this is due in part to a split which happened about 15 years ago. Those who left represented the more emotionally charged element within the group. In the process, Xenos lost their gifted worship leaders, plus a ton of people who followed them out to the local Vineyard. I don’t think they’ve ever found a comfortable way to re-introduce singing into the gatherings of the church. At this point in time, you will likely attend one of their “central teachings” (large gathering) and your home church (small gathering) without ever joining together in song with your fellow believers. That strikes most folks (including myself) as a pretty lopsided way of going about things. The breakout session leader encouraged us to develop consistent devotional lives, committing to regular times of prayer, reading, and fellowship with God. He reminded us all how helpful songs can be in engaging our hearts to the Lord’s presence. I heartily agree 😉 His words about involving the affective side of our selves echoed the very same things that I shared with Dennis over lunch. So that was fun to hear. 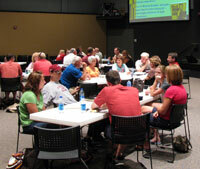 The other workshop I attended the first day laid out Xenos’ approach to discipleship. It became evident during my stay in Columbus that discipleship is big at Xenos. They do it in pairs or small groups so much that practically everyone is either “discipling” someone or is being discipled by someone (or both at the same time!). One of the college students introduced two guys to me by saying “that guy over there is my disciple, and that other guy over there is my discipler.” That’s a little weird to me. But then many “xenoids” roll their eyes at talking that way about it. Either way, they’re very committed to meeting with each other as mentors, counseling one another on issues of character development, doctrine, and service. To talk to a member of Xenos is to, at some point in the conversation, be counseled and exhorted towards a more committed walk with God. They seem to wear that comfortably. They’re also very Bible-centered as a people. They talk an awful lot about “getting into the Word” like it’s, well, central in a way that I’m persuaded it’s not supposed to be. I would argue that the Bible itself even warns us against being “bibliocentric.” But there’s not space left for that talk in today’s post. Perhaps one other talk merits mention here. 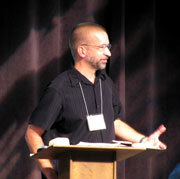 The main speaker for the plenary sessions was Ajith Fernando, director of Youth for Christ in Sri Lanka. 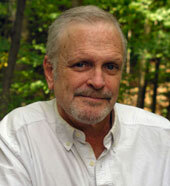 He’s an internationally popular writer and a great speaker. He spoke on “Joy and Pain,” and how these two things go together when you commit your life to investing in the lives of others. It was good stuff, and I think it was very well received. I also think he may have thrown in a corrective word or two for either the church immediately before him or else American churches in general. He warned against an overemphasis on results. Americans are pragmatists, and he admitted that this brings certain benefits. But he also reminded us all (many of whom are active in ministries of so many kinds) that we must be faithful to our callings without making the output our chief gauge in that regard. Sometimes a person pours his or her life out for decades only to have someone else reap the harvest later on. But the Lord is getting what he wants, how he wants it. I think we all need that reminder, although I see such a heavy leaning towards pragmatism at Xenos that it turns me off just a little. The leaders invest scads of time and energy studying other groups to see what works and what doesn’t. My host, Jim, told me of how the leaders take a group of young people on church tours around the country in order to see how other groups are doing church. Granted, that’s exactly what I’m doing, too, even as I write. But there’s a focus on results– measurements and percentages–and their findings get thrown around a good bit in conversation. All that makes me suspicious that something’s off, something I encountered in one or two other groups this week (more on that another time). 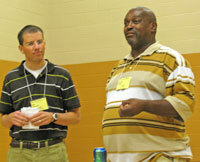 Every year in July, Xenos Fellowship in Columbus hosts a large Summer Institute. People come from all over the country (with quite a few from other countries) to hear challenging messages from internationally known speakers and to attend workshops on church life in the Xenos style. They’ve got lots of information to share, both practical and visionary. One of the coolest things about that, besides how incredibly well organized it is, is that they upload all their talks onto their website for free download within days of the conclusion of the conference. They seem quite content to have ideas and resources stolen and used frequently by anyone. That’s refreshing. Also refreshing was the fact that it was so easy to get lunch with Dennis McCallum, the founder of this huge network of churches. During the first day’s lunch break he wandered out into the foyer of the main building and stood around, apparently hunting people to share lunch with. Despite the fact that he didn’t know me from Adam, when I told him I’d like to chat with him at some point he treated me to lunch right then and there. He took me to Skyline Chili (chili is really big in Ohio, apparently) and we compared notes about a handful of events going back to the founding days of their church, when a band of ex-Campus Crusade leaders helped foment a sizable student movement across the country (all during the dynamic days of the Jesus Movement). Some of the same people who got involved in the earliest days of that group were also responsible for the group which evolved into Xenos in Columbus. All this was relevant to me because the church I’m a part of was patterned after a kind of prototype church which gathered about the same time in Santa Barbara. And both of those groups received ministry from the same band of ex-Campus Crusaders. I believe Dennis said that the founder of my church group spoke at one point to his group waaay back during those early days. Small world, huh? Something dawned on me recently and it’s connected to this very idea: When a church never gets new believers, it suffers for lack of the joy which comes from being introduced to the One Who Saves. After enough years go by, we lose touch with what it means to “get saved.” We may encounter it some through our children. But there should be more. And I’ve witnessed this week a certain zest and enthusiasm, even among seasoned old veterans of the church, which seem to have issued from staying engaged in the work of introducing people to the Lord. Among people who are into “organic,” simple church life, you are more likely to find people who go about that in more natural ways (when compared with the programmatic methods taught in so many traditional churches and parachurch groups) It feels like I encountered that a good bit this week. 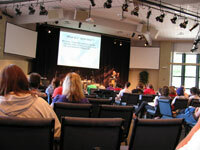 Back at the conference, the first breakout session I attended was on starting spiritual conversations. It was a talk on how to develop the habit of really listening and talking to people in order to build relationships through which the gospel may (one day) be shared. He stressed how unhelpful (and ultimately ineffective) it is to shove verses or the plan of salvation down the throats of people you just met. He encouraged us to cultivate a habit of making ourselves available for relationship building, which of course presupposes that we’re even thinking in that direction in the first place! For me, that was the take-away. One way to summarize this whole trip is to say that I was challenged to consider making outreach a part of my life again, finding some way to reclaim it from its more legalistic, guilt-driven modalities that I drop kicked years ago. Grace-driven, relational, organic evangelism…that’s what I’d like to learn more about and see modeled. More on the first conference day in the next post. Before visiting my next home group Wednesday, I ate lunch with the teaching pastor and the executive pastor of Apex, along with one of the elders overseeing some of their house churches. They had just come from a meeting in which they were hammering out a strategy for presenting their story at the National House Church Conference hosted in Dallas by House2House about a month from now. Their greatest challenge, as I understand it, is to find a common mind among the two very different mentalities within their “hybrid” fellowship. Some of them feel more at home in the traditional, centralized, top-down model of ministry as seen in the Sunday morning worship service. These folks would like to see a uniform training process implemented for all their house church leaders (like Xenos in Columbus has always used). But others see that as too controlled, not “organic” enough. The “decentralized” camp resists systematized, uniform procedures and wants more freedom for organic development among the house churches. It would seem that these strange bedfellows are cooperating for now, which is an encouragement to me. I heard someone call this a “fruitful tension.” It fits. After lunch I visited with the elder who first called for Apex to transition to the house church model, Rennes Bowers. Everyone should have at least one encouraging, paternal brother like Rennes to talk with. He’s an interesting brother with an interesting story. A fireman by trade (Captain of his company), Rennes (rhymes with Guinness) has simple/organic church roots going back to the Jesus Movement. 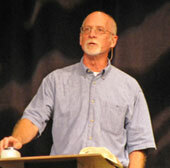 In fact, if I understand correctly, he’s the brother who introduced Jon Zens to house church way back in the early 70’s. 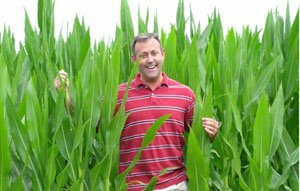 And what a champion of organic church Jon became! 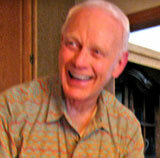 Along with Robert Banks, he’s one of the most established scholars we have. Rennes was very encouraging to me about my writing, and boy do I need cheerleaders at this point! My take on things tracks really well with his since we’ve had so many of the same influences. He also had some really helpful things to offer–some perspective balancing words of wisdom that I needed to hear. For example, my conceptual model of the Christian life is so lopsidedly mystical at this point that I hardly see outreach or evangelism in the New Testament when I read it. But somehow it struck me right when I heard Rennes talk about how Jesus first gathered people to himself, then sent them out again to share what they had received. Rennes’ own heart has always been geared towards others and he has obviously spent most of his adult years sharing Jesus with so many that it comes naturally to him. That was encouraging for me to see and hear. 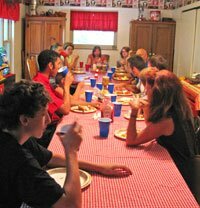 At dinner time, somewhere between 12-15 college students from Wright State showed up for the home church meeting. We sat at two long tables, lined up end-to-end, and ate some delicious beer-soaked “brats” (which I’ve never had before). During the meal, as Rennes has taught them to do, they shared “Jesus stories,” one by one. Jesus stories are instances of encounter with God during the last week (or month or whatever) in which you get to either share Christ’s love with someone who needed it, or otherwise you saw God at work somewhere, maybe even in your own life. I think everyone there shared at least one, with many of them sharing a couple. I was touched by their sincere openness to God’s leading in their daily lives. Here was no theoretical chit-chat about loving God or loving one another. This was experiential. It takes me a few days for anything significant to sink in, and with each day that passes I find myself affected more and more by their example, and by Rennes’ modeling of spiritual parenting. I think I’m beginning to see some of what it was I set out to find this week. When the meal concluded we passed around a loaf of bread and some juice, and Rennes asked me to share some about the symbolism of the one loaf. Another young brother shared about the blood of Jesus. We also prayed for one another and for the people we encountered in our Jesus stories. I liked that. 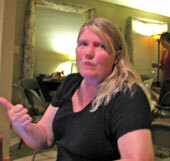 After we cleaned up from dinner, we relocated downstairs to the finished basement for the rest of the meeting. Rennes read out a passage from 1 Corinthians 12 and the group discussed what it meant to be Christ’s body, with differing gifts in a community. Students shared about things they understood and experienced as parts of the Body of Christ, and they shared prayer concerns and prayed for one another for a good while. I think I enjoyed this meeting the most because it was the most “open” and participatory one of them all. For the record, I’m losing my confidence that leaderless meetings are THE correct way to meet. For instance, when most of the folks in the room are young or maybe new believers (or some of them aren’t believers at all), more leadership is needed. But in the end I’m still sold on meetings where most people share at least something during the meeting. I’m sure I also enjoyed the meeting because I just love being with college students. There’s something ideal to me about people in that stage of life, with just the right mix of open, eager receptivity and a developing sense of unique identity. Gotta get back around college students again somehow! On another personal note, I’m growing in my appreciation for layering of maturity levels in a church. Put another way, I need people ahead of me in the Lord to who I can go for counsel, and I need people for who I can serve that function as well. People ahead of me and people behind me. That’s the best way to live. As I think back to the sweetest phase of church life that I can recall, it was when we had a group of college students regularly driving down (an hour and a half!) to be with us. It’s not that we were doing any deliberate “discipling’ or anything like what folks in these hybrids are so committed to doing. We just got to spend good quality time with them, and it felt like life was shared–maybe mentoring happened despite our laissez-faire approach to things. Well, this post is long enough. Thursday and Friday were conference days. I’ll talk about them in the next few posts. On Tuesday I said goodbye to my Cincinnati hosts and drove to Columbus to meet with one of Xenos Fellowship’s 270 home churches scattered all over Columbus. This is indeed a unique church — and they know it. Individuals and churches have been coming to them for years hoping to glean some helpful tips on how to reproduce what these folks have done. Pretty soon they figure out it’s not exactly duplicatable. Basically their story goes like this: In the early days of the Jesus Movement, a couple of pot-smoking hippies at Ohio State University got saved and, with some help from various Campus Crusade guys they began meeting with other pot smokin’ hippies and got them saved, too. 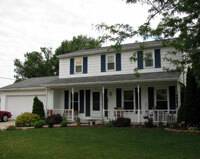 One house church became two, then four, then a dozen, and so on throughout the 70’s. Heavily emphasizing Bible study and evangelism among unbelieving OSU students, they got big enough to need some centralized support structures. That’s a pretty organic way of doing it, by the way! Two of the leaders went off to seminary and came back armed with advanced degrees and a passion for research, study, and an unusual mix of non-conformist idealism and no-nonsense pragmatism. I really could spend all day explaining the intricate, multi-layered structures and practices but that’s not really what I came to learn about. I came looking for fruit. And I’d have to say that I found a good bit. The “wineskin” felt strange in places (as it did to many people who were attending a conference this church was putting on), but the wine was recognizable and real. 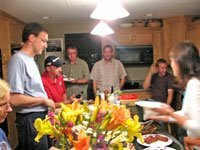 Attending the conference going on that week was far less important to me than visiting house churches which their network had birthed. Which brings me back to Tuesday night. Scott and Liz Sweet hosted the evening’s meeting at their house. Most of this group of maybe 20 adults have been a part of Xenos (pronounced zee-nahs) since the 80’s, with one or two going back to the very beginning in the 70’s. By now, these seasoned “xenoids” (as some call themselves) have birthed multiple home churches, redistributing leadership several times over. This collection of people resulted most recently from the merging of a couple of groups which had lost people for various reasons (including the creation of a new group somewhere else, I believe). One of the ladies led the discussion, breaking us up into smaller groups and instructing us to read and discuss various biblical passages which spoke of work and rest. I had to laugh because that was exactly the same thing I talked about in my church group just a couple of weeks earlier. In fact, it felt like she was using my outline for the first 10 minutes of the lesson! Pretty wild. After the lesson was over, we ate and chatted for a good hour and a half. By then it was pretty late and the wine they had passed around was beginning to convince us it was time to go to sleep. 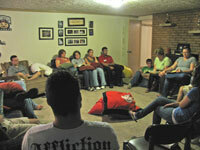 I believe Xenos’ home churches follow this same basic meeting format under most circumstances. Half an hour or so of “hanging out” followed by a lesson (led by different teachers in the group at different times), then you eat and drink and hang out some more until everyone’s ready to go home. Upon visiting a Xenos group, you will quickly notice several things. I’ll write about some of them later, but for now I’ll mention that their general temperament is very casual and non-religious, even a little rough around the edges, and that’s no accident. The leaders of Xenos have always stressed fully inhabiting the surrounding culture, avoiding the explicitly immoral behaviors which often go with it. So they have a fair share of smokers, drinkers, cussers, and all-around party folk. That’s the way they like it. They exist to be a comfortable place for people in the world to come in contact with the gospel, and they are very successful in winning unbelievers to the faith. A well-known Baptist seminary professor wrote a book about successful churches and devoted some of his attention to this church, since they boast of something like 40% of their new members as conversions to the faith. Most churches, they are quick to point out, just “win” people who are already Christians. Pretty good point, I have to admit. I don’t think a single person in my church group became a Christian through the efforts of the group. And all those megachurches who still experience growth in this era of declining church membership are just getting “transfer” growth themselves. 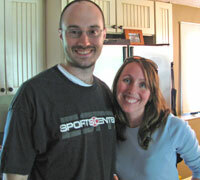 In the meantime, here are my gracious young hosts, Jim and Lisa Long, of Xenos. Sunday afternoon I spent some time getting to know another one of the elders from Apex in Dayton. Jim Schindler is a retired business man who was tapped by the young pastor at Apex to be an elder early in the church’s history. Jim had been a respected member of the mother church out of which Apex was planted. He also was the brother who traveled overseas and discovered the effectiveness of the house church model in international missions. Now an advocate of house church for American churches, he invests a good deal of time cultivating relationships with international students (online and in person). 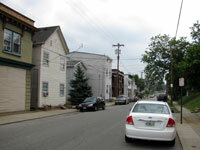 He and his wife have built relationships with several international students in the Dayton area, resulting in a small regular gathering of them in his home. 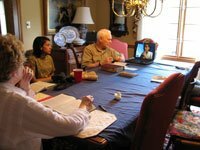 When evening came, we met around the dining room table for a Bible study which Jim led, since together with his wife he was their senior by several decades. There were students from India, Saudi Arabia, Japan, Indonesia, and the Philippines. One international student skyped in from a trip in North Dakota (see the laptop on the table). This meeting was more clearly “led” by an individual than the one I participated in earlier that day in Cincinnati. Given the relative youth and level of maturity in the faith among the students I suppose this makes sense. One of the students is a Hindu and another is a Muslim. We read through and discussed a chapter of Matthew’s gospel and answered questions asked by those present. 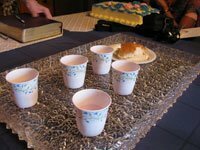 After a brief prayer our hosts produced a serving tray with a hamburger bun and small dixie cups full of juice. We ate and drank these and then got up and ate dinner together. At the end of the dinner, we shared a going away cake for on of the students who was leaving the next day for India. Her parents had arranged a marriage and she was going to start a new life with a man she barely knows (!). That was bittersweet. I was inspired by the diversity of the group, and by the ability that this group showed in reaching out to unbelievers from other faiths. 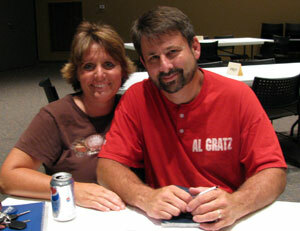 The host couple shows a genuine calling to minister to this population of their church. That was encouraging. Pretty exhausted from two days of solid travel and meetings in two different cities, I returned to my futon and slept like a rock. Day three (or four, if you count the first night, too) was a day off from meetings. Time to process and chill out for a while, ’cause the next few days were full indeed. Sunday morning I (along with my hosts Scott and Angela) visited a unique community of house churches who call themselves Vineyard Central. Apparently they originated as a church plant from “The” Vineyard, but that hardly seems to characterize them at this point. This group of believers, like the one which I am a part of, chose to buy houses close together–in the same neighborhood. They are a “neighborhood church” as a friend once called it, like my group. 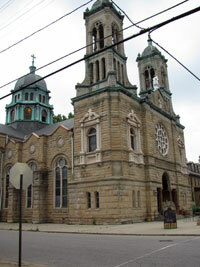 This church, however, chose to inhabit a poor, urban section in the heart of their city. They did this because they felt a calling to establish a presence in that community, and they appear to be doing just that. Amazingly, there are around 80 of them in the neighborhood, with some still moving in! It’s pretty raw, authentic, incarnational living. I could tell from their interactions with their neighbors that they are at work doing what they set out to do: building relationships with those in their neighborhood, maintaining community gardens, helping out people in need, and (formerly) operating a cool coffeehouse as a point of entry for people in the community (sadly, economic times being what they are, the coffeehouse may have gone the way of the do-do). It’s messy work, fraught with the costs of giving your lives over for the sake of needy people. 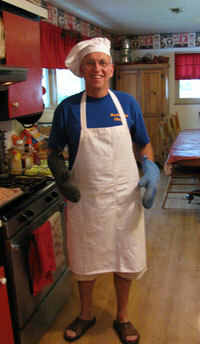 But they struck me as a very hospitable, giving, accepting group of people. 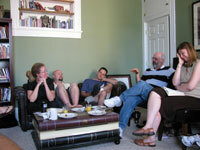 Their house churches meet weekly while the whole group only assembles together about once a month. Another unique thing about this group is that they are liturgical. They are “low church” in the sense that they are a clergyless, decentralized and informal assembly who show up in t-shirts and jeans, meeting primarily in their homes. But they read from “the lectionary,” pray the creeds, and pray “the hours.” After someone reads a portion of the Bible, he or she says “the word of the Lord” and everybody responds in unison with “thanks be to God.” Haven’t done that since my teen years when I used to visit an Episcopalian youth group. It’s unfortunate for us that we didn’t get to be a part of their bigger monthly gathering. On those days, typically coinciding with festivals from the traditional Christian calendar, they all come together in an old catholic church building called Saint Elizabeth’s which they purchased and renovated over a decade ago. This morning’s meeting, however, happened upstairs in the house across the street. We were greeted warmly, we sang songs recently compiled by one of them on a songsheet, and we read aloud and discussed verses from the lectionary, a standardized grouping of Bible passages used in liturgical churches (Anglican, Catholic, etc). Next someone brought out a plate with a multi-grain bagel and a bowl of wine on it. They passed it around, tearing off a piece of bagel and dipping it in the wine before eating it. Each person passing the communion repeated something like “the body of Christ which was broken for you and blood of Christ shed for your sins” (I couldn’t remember the right words so I just passed it on and shrugged). When we finished with that we had a time of prayer, then we ate and chatted with folks for a while. They were warm, caring people who obviously carry the burden of ministering to their neighborhood in a very incarnational way. The fatigue of some of it showed, as did the resolution to keep giving, keep serving, and to keep meeting and praying for those around them. In the end I found the liturgical worship too foreign to easily enter into. I find it hard to internalize standardized phrases and prayers, no matter how time-tested they may be. But I also think that these folks don’t experience those things in the same way I do. For them, it seems living and somehow vibrant. In the end it’s all about what’s going on inside, isn’t it? For me, reciting rituals easily lends itself to mechanical repetition, disconnected from the heart. But I’m not sure it has to be that way. I suspect some can take those pre-formed prayers and creeds, connecting their hearts to the messages preserved therein, and it becomes living words for them. I bet that works better for first-generation folks than for second or third ones, though. That’s my guess, anyway. Coming out of that meeting I bumped into a completely separate group of people gathered on the front steps of St. Elizabeth’s. They were from neighboring cities and were using the neighborhood facilities as a centralized point at which they could all gather for prayer and fellowship. 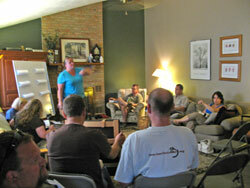 Although they were not really connected with VC, their example seems to have encouraged this group to pursue community in their own way as well. Pretty cool how groups seem to inspire one another along the way. Folks thinking about building deeper community among believers seem to get so much from just seeing other people doing something similar. It’s great to steal ideas, too, while you’re at it! Well, that just covers Sunday morning. In my next post, I’ll share about the third group that I met that day. 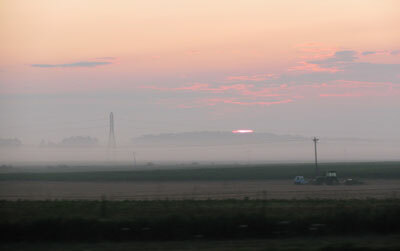 You are currently browsing the Check Back Later blog archives for July, 2009.